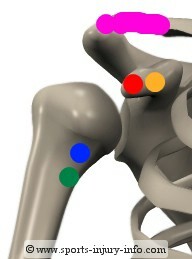 The shoulder tendons are often overlooked when it comes to shoulder anatomy. Tendons are not as flashy as muscles...most people don't even think about the tendons when they are working out or lifting weights. Tendons attach muscles to bone. They are the connective tissue that keeps musles working. And there are a lot of tendons in the shoulder. Rather than talking about all of the many tendons in the shoulder, lets look more closely at the ones that are most commonly injured. After all, thats why you are here. 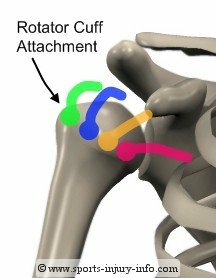 The rotator cuff is the most well known group of muscle in the shoulder. This is what you think about and hear about when you talk about shoulder injuries. Most rotator cuff injuries occur within the rotator cuff tendons. The rotator cuff tendons attach on the edge of the humerus, coming from the muscles on both the front and back of the shoulder. They are placed in a somewhat precarious position because they wrap around the top of the humerus. This position leads to a decreased blood supply in the ends of the tendons, what your physician may refer to as the "Watershed" area. This lack of good blood flow can cause an increase in potential injury. The long head of the biceps tendon attaches at the shoulder. The short head attaches here too, but I will talk about that one next. The biceps long head tendon runs along the humerus, through the bicipital groove, and over the top of the humerus to attach on the scapula. 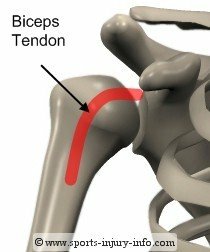 This tendon actually attaches into the glenoid labrum (cartilage of the shoulder). This specific attachment makes it susceptible to injury. As the biceps long head tendon moves over the top of the humerus, it makes a sharp turn to its attachment point. This turn, at the bicipital groove leaves the tendon vulnerable to lots of stress. Biceps tendonitis is a common shoulder tendon sports injury, and it usually occurs there, where the tendon runs through the groove, on the front of the shoulder. The biceps long head may also be involved in labral tears, specifically SLAP lesions, where it attaches into the glenoid labrum. While not an all inclusive list, these muscles are the most commonly injured and most well known in the shoulder. They are also the muscles that are implicated with shoulder injuries like impingement syndrome, and so they play a role in sports injury. Shoulder tendons are extremely important in shoulder function. They attach the muscles to the bones and make the shoulder work. Shoulder tendons like the rotator cuff and biceps long head are more susceptible to injury because of the way they attach, and the decreased blood flow in this area.